Posted by WorldbyStorm in Culture, Media and Journalism. Four directors of the Pilgrim House Community, which is funded by the Health Service Executive, placed a half-page advertisement in yesterday’s paper in which they apologised to the founder of the organisation, Helena O’Leary. In the advertisement they apologised for the damage caused by their “dishonesty” to her seven years ago and for lying about their reasons for being part of the organisation. THE DIRECTORS of a controversial religious community involved in the care of people with disabilities have refused to explain the background to a public apology they published in The Irish Times yesterday. Well, yes. Curiously the term “refused to explain” is used in the unusual sense of meaning that they did actually explain. Speaking to The Irish Times, Bridget Anne Ryan … said the apology had been made in a personal capacity by each of the signatories. She declined to be drawn on what the apology related to except that the issue attracted misleading media coverage of the organisation and ended the spiritual community which existed within the organisation. There. We have it. Story over. Final word. Doesn’t want to say anything else. I have nothing else to say except that how deeply sorry I am,” she said. Grand. Nothing to see here, everyone move on. She’s said her piece and who are we to demand more. Okay. That was it. Nothing else. Prying would be indelicate, if not indeed wrong. Dialogue Ireland, an organisation which gathers information on new religious movements, says Pilgrim House has displayed cult-like characteristics and it has passed this information on to religious authorities. The Health Service Executive yesterday confirmed it provides about €210,000 a year to Pilgrim House for providing a full-time residential service to five clients with intellectual disability. So, after that impassioned statement that there was no more to tell, I was more than a little surprised when I read this in today’s revolutionary, all changed, new age – I mean of course a new age for the – Irish Times. I WAS one of four people who made a public apology in this newspaper last Thursday to Helena O’Leary for the damage done to her, a Christian peacemaker, spiritual teacher and mystic. I decided, as did the other three signatories, that on that day I would make no comment on the advertisement because I did not want to say anything that might distract from its simple purpose. That was very good of her. But seeing as I’ll bet most people actually didn’t notice it first time round perhaps less good of her (and oddly the Irish Times) to bring it to our attention both in the original article and this follow-up. In this article I am speaking only for myself; although four people shared a desire to make an apology our reasons for needing to do so were very personal and very different. I first met Helena O’Leary in 1994 when I was editing the Irish Catholic newspaper. I knew her by reputation as a spiritual teacher with unique insight and wisdom on the “God-given gift of people with intellectual disabilities”. I had also heard about her work on behalf of illegal immigrants in Ireland and France. Helena O’Leary had doubts about our motivation for being part of Pilgrim House and she expressed them many times. But I reiterated my desire to be part of Pilgrim House and asked for people’s trust. Trust was given to me because “no one owns a spiritual movement”, she said. I abused that trust. When problems in my marriage began to appear I allowed the environment of Pilgrim House to be blamed for them. I and my former husband had a history of personal irresponsibility. In my case, as an adult I had chosen to be a victim and my ex-husband had his own personal difficulties. We had left Pilgrim House and when the marriage ended I returned. I knew that our personal issues were not resolved and that Pilgrim House, and Helena O’Leary in particular because she was the person who embodied most clearly the values of openness and truth, would be vulnerable to scapegoating. I knew that and did nothing. In 2001, when a severe trial came into the life of Pilgrim House in the form of a media attack in the aftermath of the suicide of a woman who was part of the community for many years, I did not protect and defend this life which had so nurtured me and healed me from the lies that were spoken and recorded. I allowed my ex-husband to use this tragedy to have his grievances about our marriage break-up aired publicly with no thought on my part for the people whose trust I had so violently broken. Immense damage, spiritual and economic, was done to Pilgrim House. Again a tragic set of circumstances. Some detail would be useful. But it’s not that sort of apology. You think God belongs only to you? He doesn’t. God is an immortal spirit who belongs to everybody, to the whole world. You think you’re special? God is not an Israelite. You don’t have a choice. Neither do I. Remember, we’re bringing God and man together. They’ll never be together unless I die. I’m the sacrifice… Forget everything else, understand that. The Messiah doesn’t need miracles. He is the miracle. Now he’s here. Are you ready for me? I’m here to tear down everything around you, and you know what I’m going to replace it with? Something new: God. The World of God. So take your bread and give it to the poor. What difference does it matter what you own? You have gold and silver? It’s going to rot, and that rot is going to eat away your heart. All of you! There will be a flood, and there will be a fire. Everything will be destroyed. But there will be a new ark riding on that fire, and I hold the keys and I open the door, and I decide who goes in and who doesn’t. You’re my brothers from Nazareth, and you’re the first I invite on the ark. Don’t wait. Don’t waste your life. Come with me. Now imagine a thumping 4/4 beat at the end of that and you have something of a taste of “The Prophet”. But strip away the beat and you have a demonstration of just how easy it is to slip into the sort of language we see quoted in the article. Truly being a peacemaker and mystic is a lyrical sort of a gig. Nice one. …accepted that I lacked authenticity in questioning other peoples’ motivation for attacking the spiritual life when I was not holding myself accountable. I accepted that I was limiting my own life by not taking personal responsibility. With Thursday’s apology that personal, spiritual work has begun. It has indeed. A good days work I think we can all agree. Bukharin: Citizen President and Citizens Judges, I fully agree with Citizen the Procurator regarding the significance of the trial, at which were exposed our dastardly crimes, the crimes committed by the “bloc of Rights and Trotskyites,” one of whose leaders I was, and for all the activities of which I bear responsibility. I once more repeat that I admit that I am guilty of treason to the socialist fatherland, the most heinous of possible crimes, of the organization of kulak uprisings, of preparations for terrorist acts and of belonging to an underground, anti-Soviet organization. I further admit that lam guilty of organizing a conspiracy for a “palace coup.” And this, incidentally, proves the incorrectness of all those passages in the speech for the prosecution made by Citizen the State Prosecutor, where he makes out that I adopted the pose of a pure theoretician, the pose of a philosopher, and so on. These are profoundly practical matters. I said, and I now repeat, that I was a Deader and not a cog in the counter-revolutionary affairs. It follows from this, as will be clear to everybody, that there were many specific things which I could not have known, and which I actually did not know, but that this does not relieve me of responsibility. We came out against the joy of the new life with the most criminal methods of struggle … but my counter-revolutionary confederates, and I at their head, endeavoured to murder Lenin’s cause, which is being carried on with such tremendous success by Stalin … Counter-revolutionary banditry has now been smashed, we have been smashed, and we repent our frightful crimes. Bridget Anne Ryan’s plight is clearly, despite personal tragedy, far less serious than that which faced Bukharin. And perhaps the comparison is indelicate between victim of Stalinist show trial and forced confession and this situation. On yet another tangent, could this be a trend? Public apologies to those in positions of power… I mean of course, peacemakers, spiritual teachers and mystics. I have a number of people I want to apologise to… no, maybe more than a number. A lot. A very very large group. Ah, feck it. I’ll apologise to everyone I every worked for or with – or indeed anyone in the future. And the beauty of this? Why the Irish Times wins twice over. It gets to host the advertisement and then reference it afterward. Spiritual teaching and mysticism. The memories. Many years ago I worked in New York close to a shop which sold crystals, had a rock garden and a pond inside which was crossed by a little walkway and garish pink and yellow paintings done in a faux Indian style of sylvan glades and such like adorned any blank space on the walls. It was like walking into something made of candy floss. Rumour had it that in the back there was some sort of immersion tank where people with more money than sense went to lose and then – one presumes – find themselves. How useful in a planetary context of endemic mass poverty, hunger and conflict to spend so much money on oneself… Mind you the pond was quite nice. If you like that sort of thing. Meanwhile, keep reading your free to view on the web Irish Times. On Friday you might see a piece in the Business Section about Feng Shui and how it can help your business beat the recession, it’s all a question of wads and wads of cash handed out to people who would be better employed as interior decorators – oh wait, apparently they are. Also there’s possibly a timely piece about Scientology and its massive contribution to Cinema in the Entertainment section (of course you’re a religion guys, don’t you get it, that makes it worse) while in the weekend section tips on (very very) large marriage ceremonies from the Unification Church. John Waters and Breda O’Brien will be submitting their pieces as normal. Could you make it up? On the evidence of today’s article, probably not. And remember, this is in the Opinion & Analysis section in our ‘paper of record’! ’nuff said. Posted by WorldbyStorm in Irish Left Online Document Archive, Official Sinn Féin, Workers' Party. 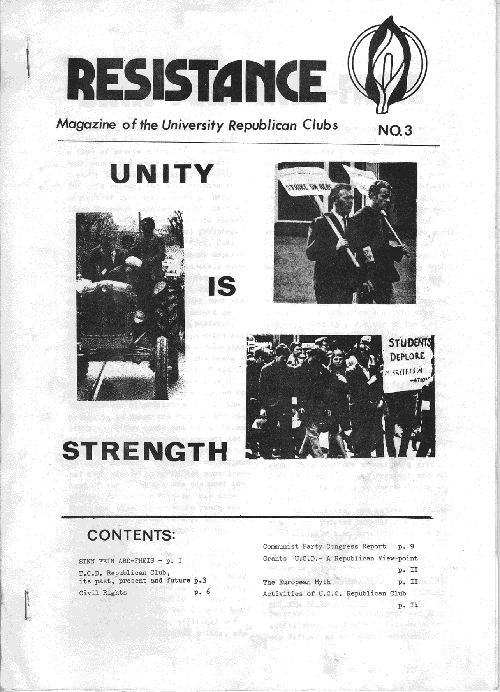 Resistance was a magazine (originally entitled Republican News) produced by the Republican Clubs in Trinity College Dublin during the early 1970s. The RCs had been founded in the late 1960s but had been ‘defunct for some time due to the imprisonment of Conor Lynch and Pat O’Sullivan’. Revived it immediately ‘voted in favour of affiliation to Sinn Féin Gardiner Place’. The E.E.C. provided a ready made issue to organise around – although the magazine notes that the efforts of the Republican Clubs to assist in the development of a ‘broad based Socialist Alliance of left wing groups such as the Markievich Society, the Labour Party and the Maoists on such common issues as the EEC… petered out…[as] these groups seemed to be more interested in talking for the most part about their own policies and refusing to give any ground on them’. As ever with such groups the magazine notes the ‘first sale of the United Irishman amounted to 25 dozen copies within the College…’. The tone is intriguing. For example one reads that the ‘Club will continue its policy of challenging political hacks on open platforms in the University, and will intensify its efforts to show up the bankruptcy of Free State capitalism’. Didn’t hear much of that language in later years. Note the coverage of both the (Official) Sinn Féin Ard Fhéis and the Communist Party Congress. This period, particularly in the run-up the the EEC vote saw considerable cooperation between OSF, the CPI and the left in the Labour Party through the Liaison of the Left. The E.E.C. is characterised in an article as an instrument of U.S. policy developed in order to be a ‘defensive ring set up to protect capitalist interests in Western Europe…’ although it acknowledges in passing that ‘though political idealism may have motivated some of the individuals involved, and undoubtedly inspired many of the ordinary people, it is the nature of the underlying forces which determine the nature of the Community’. Another article of note is the piece penned by a ‘worker’ with the title ‘How could students participate in working class activities’ which probably has even more relevance today than when it was written. Whether the not entirely idyllic relationship the ‘worker’ describes when s/he recalls ‘fraternisation’ between students and workers in the dim and distant past was ever accurate, the article certainly articulates various perceptions. It also references the Internationalist-Maoist’s in rather uncomplimentary terms… which in fairness to the latter indicates that their reputation succeeded them ‘the revolutionary Maoists adopted a ‘bull in a china shop strategy’: superficially it may appear a correct even courageous action on the part of the student-revolutionary who takes up a job in a factory…hoping to raise the political consciousness of the workers…from the worker’s point of view the situation may not be so clear-cut. He knows there is vast unemployment in the country: he will most likely have a relative or friend searching for a job, yet here is a member of the privileged classes denouncing on the one hand the rotteness of the political system we live under and on the other hand helping to exacerbate the problems created by that system by taking up a job he doesn’t need and thus depriving the worker’s relations and friends’. The old OSF/WP pragmatism (and antagonism) evident there then. “Pure” national struggle goes to the other extreme from “pure” social struggle [an interesting reference to preceding thoughts on the Derry Labour Party]. It sees anti-imperialism in oversimplified military terms. The British are to be got out of Ireland by force of arms and whoever assists them must be dealt with as a collaborator. Therefore the Protestant working class is delivered a simple ultimatum rather than opened up through democratic channels for mass agitation to develop its objective interest against imperialism. And there is also indirectly a reference from the CPI Congress where it is noted that a resolution ‘condemned ‘bling cats of violence by ‘elitist’ anti-Unionist groups [and] pointed out that ‘the state terror inaugurated by the British Army cannot be defeated by such acts of counter violence directed at civilians in their places of work, their centres of social gatherings and other public places. Such acts only help to grieviously divide the working people.’. From tomorrow, the Irish Times newspaper will once again have its own dedicated website at http://www.irishtimes.com. There will be no subscription charges for most users; people will be able to read today’s edition, and access papers from the past 12 months, free of charge. The Ireland.com site is one of the most popular news sites in Ireland. Its last audited traffic report from the Audit Bureau of Circulations – for the month of October – found it had 1.2 million unique users in one month. This had not translated into a serious base for subscription. …it has built up fewer than 10,000 individual subscribers (implying revenue of around €790,000 a year for the site, since the annual charge is €79). The number of people paying for content is actually considerably higher, at 40,000, when you include corporate subscriptions and users of its paid-for e-mail services. I can’t work out whether I am surprised it’s so high, or did I think it would be lower. 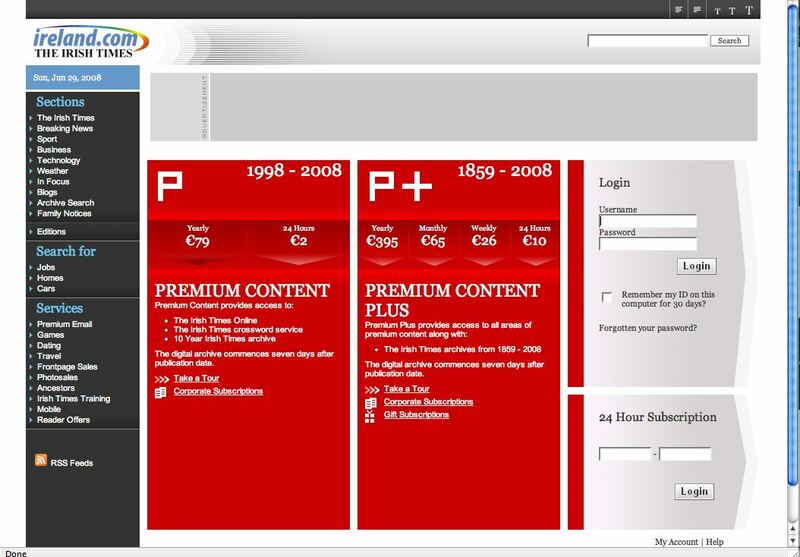 Certainly some of the features one got for subscription were/are actually very worthwhile, although perhaps not necessarily useful – if one can make that distinction. For example the digitised archives of the IT are a joy to behold, and note that they won’t be available to the general user. That said their archival search engine is a little ropey and to have a genuine value as a research tool would require significant upgrading with more options. 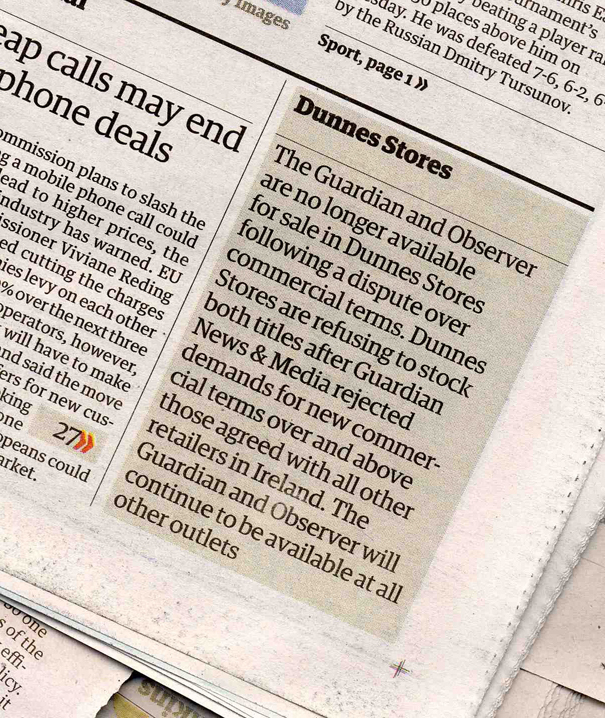 For those who have shelled out on subscriptions there is also good news. Subscribers will be refunded the balance of their outlay. Subscriptions will now be required only to access the full newspaper archive on Irishtimes.com, a service that will probably be required mainly by group users, such as universities and corporations. Donovan said it had become clear that there were not sufficient numbers of Irish Times readers prepared to pay for online content. The Irish Times is not the only paper to admit defeat on this; the New York Times and Financial Times have both dropped charges in recent years. I was always puzzled as to why the IT cleaved to the subscription line when other media outlets such as the Guardian had jettisoned it long before. Irish exceptionalism? Perhaps. It always seemed to be an oddly money-grabbing and oddly exclusionary practice. As it happens I have access through subscription (which I don’t pay myself). But I almost invariably purchase the actual hard copy on Friday (recruitment and business section) and Saturday (no good reason at all now I come to think of it). Meanwhile, Ireland.com is being relaunched as a lifestyle portal site which the Irish Times is branding as ‘Ireland’s home page’. ‘Lifestyle portal site’? To be avoided I think. An interesting piece on SlateV about Tony Schwartz [you have to go looking, but it’s there alright on the right hand side of the screen under “RIP, Mushroom Cloud Man] who is regarded as one of the most important political advertisement makers in the United States. It was he who created the remarkable Lyndon B. Johnson “Daisy Girl” television spot during the 1964 U.S. Presidential campaign, which according to his obituary in the New York Times is now ‘…generally considered to be the most famous political ad to appear on television’. The spot caused such an uproar that it aired only once, but many media watchers believe it ushered in the era of negative advertising in politics that persists to the present day. What I find most interesting about his work is the way utilises sound. Schwartz had lost his sight for a period when in his teens and it seems reasonable to suggest that this gave him an increased awareness of how sound shaped perception. Add to this his profound agoraphobia – which was so pronounced that throughout his career many politicians had to make the trip to his home where he produced his work – and it is clear that he was uniquely suited to shape sound to the rising visual medium. The “Daisy Girl” advertisement certainly played on that with a booming voice intoning a countdown over the image of the girl. That uneasy juxtaposition serves to foreshadow the unexpected image of the nuclear explosion seconds later. The jury may well still be out on the ramifications of that particular pioneering work. Schwartz had a degree in graphic design from the Pratt Institute and worked as an artist for the US Navy. As it happened he was a Democrat and was particularly keen on health promotions, his work for the American Cancer Society was innovative in terms of promotion. But to contextualise how novel his style consider this more traditional television spot for Barry Goldwater from the 1964 campaign (incidentally, am I wrong, but didn’t Hillary Clinton do volunteer work for Goldwater then?). It seems to tick the necessary boxes, with overt displays of patriotism, clips of Kruschev threatening the United States and a short piece to camera from the candidate. And yet the political and emotive power of the advertisement is stifled by the entirely conventional structure. It is, of course, unwise to ascribe simple casual relationships between such material and actual political outcomes. And on a political axis it was never likely that Johnson would lose to Goldwater, particularly in the aftermath of the assassination of John F. Kennedy. But, it is possible to argue that the much more succinct and emotive messages contained within the Johnson advert are more effective as political messages. Almost inevitably, the Johnson advert was emulated in a piece for the Hubert Humphrey campaign four years later. The visual imagery was clever with a nuclear explosion run forward and in reverse. However, it lacked the human element accentuated in the juxtaposition of the young girl and the nuclear explosion. Humphrey did not win. By contrast consider this Nixon advert, which perhaps uneasily appropriated elements of youth culture and advertising, and yet seemed in the almost blandly innocuous message to point towards much more contemporary modes of political and commercial imagery. Schwartz always took umbrage at the suggestion that his work introduced a profoundly negative element into political advertising, and it truth you only have to look at campaign posters from prior to this time from any country to see that negativity has been central to political communication, but, that said he was pivotal to introducing it to US television campaigning. Posted by WorldbyStorm in British Labour Party, British Politics, Uncategorized. Here’s the imaginary scenario: three or four cabinet ministers backed by senior backbenchers go to the prime minister to say it’s over. Most ministers are just waiting for someone else to break the glass. An election between several candidates would be no bloodbath but just what Labour needs to regain public attention. Miliband and Johnson would be lead contenders, Straw would go for it, Hutton or Milburn would hold a torch for the privatising right, and Cruddas for the progressive left. Public debate would not be chaos: it would force the winner to bound out of the gate with a new crystal clarity. As for bankruptcy, only a new leader can now raise funds for the party. Let’s be clear. This is not happening. No such deputation exists. Those who think about it also think the cabinet so spineless that none will dare. “Oh, wake me up if anyone does anything,” said one despairing MP. Ministers look at one another and say nothing. Older MPs say the young ministers simply have no idea how horrible eight or 18 years in a rump opposition will be, watching Tories demolish cherished Labour projects. They lack mettle, this generation that had it all on a plate. They never lived through years of fighting Militant and forging New Labour. This is their Clause Four moment, their moment to save the party, and they’ll probably flunk it. It should have been before the long summer break: the autumn conference will be dire. The one who dares first may be the one who deserves the crown. They have another fear: if Labour goes down badly under Brown, a rump party of mainly leftist old Labourites will select some unelectable leader and seal the party’s fate. Better to choose the best now so that, even if Labour loses, it’s a soft landing with a good leader who lives to fight another day. I’m not sure whether Toynbee subscribes to such views, indeed her piece is near masterful for not taking a particular side… Still, to articulate such thoughts is a step forward from thinking them and step closer to wanting them. To hear them from an increasingly critical, yet largely supportive, voice of Labour across the last ten years must give pause for thought. Particularly in a week where we have seen historic lows in Labour’s poll. Particularly on the day that Labour is beaten behind the BNP in the Henley by-election, and what a lovely gift that was to Gordon Brown on this anniversary, a year in power. Because it is that serious. It’s hard to see how Labour could be pulled back from its current political situation. That said, a genuine break with the past? It might minimise the fall-out and leave something new to be fashioned. Either way I’m guessing Toynbee will be off the Christmas card list this year. Onlookers may think there is no point in changing leaders for cosmetic reasons: a smilier or a younger face can’t save the day. The trouble lies in the muddy messages they have all put out in recent years. Ministers are rightly hastening to nail to the floor every good policy while they can, but without a story to tell, without crisp contrast with the Tories, frantic activity can’t forge an election-winning identity. No one need bother urging any new leader to step up to the plate unless they have a better answer to this: what’s Labour for and what is it definitely against? That’s the core question. But who is left to answer it? Meanwhile the more eagle-eyed amongst us may have noticed this interesting block on the lower right-hand corner of the front page of the Guardian (and it was there yesterday). Anyone have any details, and is it restricted to the North or South of the island? THE PROGRESSIVE Democrats have decided to quit their Dublin headquarters, following cuts in State funding and lay-offs since the last election. The party’s South Frederick Street offices were the backdrop for some of the most exciting events in Irish politics from the mid-1980s onwards. Hmmm… ‘most exciting’? I wonder. Surely they’re not talking about the stupid chair through the window incident some years back. Oh no, they’re talking about the ideological turmoil of the late 1980s. Was that exciting? Not to me. In fact I thought there was something pretty effing horrible about the ‘mass’ meetings around the time the party was founded, I remember the TV shots of the one in the Shieling Hotel in Raheny, and it spoke of something very nervy indeed in the Irish polity at that time. But, that first flush of enthusiasm over the reality of the PDs was rather pedestrian. Utterly wrong, politically, but nowhere near as extreme as they were painted. Sure, for some they were the epitome of political evil, but a telling anecdote was told by a friend of how when meeting a PD in Dun Laoighaire and when said PD was asked what they intended to do about childcare provision the answer came ‘well, of course, we want to see it increased…’. My friend as it happens is from a different jurisdiction and is economically and socially on the right, but was amused to see how he produced near incomprehension from the PD when he pointed out that he actually wanted to see childcare and all the pomps and works of the state reduced. But, I guess the PDs were what passes for excitement amongst the somewhat rightward thinking bien pensants in our society (For some reason Stephen Collins name springs to mind), not least due to the rhetorical dust kicked up by McDowell during and before his leadership. Since those heady days for generally polite, but sometimes unpleasant, rightists, there have been changes… for the worse (or better, dependent upon taste). However, just two party staff work daily in the offices, compared to at least eight when the party’s fortunes were at their height. Now, the owner of the building has decided that he wants to sell up, for €2.75 million, and the party has decided that smaller premises are required. The party had the opportunity to buy the building for approximately €1m in late 2001, but the plan fell through. The PDs’ national executive had then agreed, and a number of party members had offered interest-free, repayable loans, but the parliamentary party objected. One wonders why, particularly since they did rather better than expected at the subsequent election in 2002. But it can’t be good news for the continued existence of the PDs as a political formation. Their showing during Lisbon and their contribution to debates on the matter almost non-existent, which is quite a feat for a party with a senior government Minister and former Tanaiste at the Cabinet table. The decision to depart South Frederick Street will be another blow for the party’s membership, following last year’s disastrous election results. In addition, the lack of visibility of the new party leader, Senator Ciarán Cannon, who took over from Mary Harney, is causing increasing concern within the party. And yet, I wonder. A small part of me tends to the idea that if Cannon can keep the ship afloat for just a couple of years there is a very very slim possibility that in the face of a weakened Fine Gael vote that the PDs might offer something of an alternative home for their voters. It’s hard to see how it can happen, not least because Cannon is locked away in the Seanad. So I wouldn’t put money on it, but stranger things have happened. The South Frederick Street offices became nationally known after files detailing donors’ names and contributions were accidentally dumped in a skip outside the building in 1997. Which is a bit careless. And somehow also tells us something about the disparity between the image and the reality of the PDs. Far from a right wing juggernaut rolling across the Irish political landscape they were a curious collection of divergent strands. Not many though, it has to be said. For which we should, perhaps be grateful. And also grateful for their (mostly) being in power during times of plenty where any tendency to mischief, such as dismantling what we have of a welfare state was clearly circumscribed by significant revenues into the public coffers and a Fianna Fáil delighted to play munificent benefactor to the nation. Their time has passed? No harm. Not so nice to see them in action during a recession I would imagine, and perhaps my friend might find them a tad more congenial. The 77-year-old TD and former director of elections for Fianna Fáil has supported the government since his election in 1997. He told yesterday’s Kerryman he had won his “three-in-a-row” and that was his final rally. …[he] expects his son, Michael, a councillor and outgoing mayor of Kerry, to run as a candidate. Chip and block are the words that spring most readily to mind. Michael has some interesting views on social issues. A it happens he reminds me of nothing so much as certain individuals in the DUP. Which I guess is inevitable in a context where self-promotion is all, and political ideology is rather scant (not that the DUP is an ideology free zone, just that the national/religious issue took precedence over mere economics). Michael Healy-Rae confirmed his political ambitions were longterm, and that he would be looking to run for the Dáil at the next election. He would also be contesting the local elections next year. And ideology isn’t unimportant. When histories come to be written on these events it is unlikely that Healy-Rae will garner too many plaudits, not least because unlike Gregory his participation was not absolutely crucial to a government formation. But worth reflecting also on how even a very fleeting event such as the Gregory Deal can shape a political legacy. I’m not quite suggesting that Gregory ate out on that subsequently, but his public persona is very much a product of one hugely significant, but transitory conjunction of political circumstances. Indeed, the thought strikes me that fellow ‘Independent’ Michael Lowry received almost no flak in the media over his support for this latest coalition of all the talents, which is remarkable when one considers his journey from the inner circle of Fine Gael to chief of his fiefdom in Tipperary – and note the brace of Councillors he has as part of his Lowry Team… Although the late lamented Seamus Healy managed a similar trick – in terms of Councillors – in the adjoining constituency. Not sure what that tells us. Or what of Finian McGrath, surely the luckiest government supporting Independent in history who had the remarkable foresight to seal into his deal with Ahern a derogation as regards the Lisbon Treaty. Now that’s what I call winning, twice over! I’m sure Ahern thought that a minor concession when he signed the agreement, but he should have recognised there is no such thing as a minor concession in politics. People say McGrath lost support by doing the original deal, and indeed he did, with some of his support base detaching, but… no harm for him to shore up his rather tarnished radical credentials by appearing at news conferences with McKenna et al. That this might well produce a certain cognitive dissonance amongst his constituents is neither here nor there. Posted by WorldbyStorm in European Politics, European Union. It’s hardly unreasonable to suggest that in politics it’s more than likely the statements of friends rather than enemies which puts the most pressure on a politician or enterprise. Think of Michael Lowry and how his fate was effectively sealed by John Bruton’s crie de couer that he was… ‘…my best friend forever’… and as an aside, didn’t Charlie Landsborough have a song using more or less that formulation? And so Brian Cowen might well have reason to be dragging out the voodoo doll of Giscard d’Estaing left over from previous Euro encounters and plunging a knitting needle through it’s torso. For the king over the water of the EU has opined once more, and in such a way as to be most unhelpful to future progress. RESTORING AN EU commissioner permanently to member states is simply “non-negotiable” in the aftermath of the Irish No vote on Lisbon, former French president Valéry Giscard d’Estaing maintains. “It isn’t reasonable. There will be Irish commissioners, but by rotation,” he told The Irish Times in an interview yesterday. The commissioner issue is seen as key by many to making the treaty acceptable to voters in any new ballot. And Mr Giscard, who served as president of the convention that drafted the failed European constitution, angrily denounced as “dishonest” the repeated use of a quotation attributed to him by Irish No campaigners during the Lisbon referendum. Mr Giscard’s next, unquoted paragraph, however, makes clear that he regarded such an approach as “unworthy” and likely to “confirm European citizens in the idea that the construction of Europe is organised behind their backs by lawyers and diplomats”. the passage quoted pertained only to France. “The French had voted on a first treaty, and there was talk of a new one. How helpful. But not the sort of precise clarity that might help to assuage those who take the No position who argue that Lisbon was the same as the Constitution. “Everyone decided that there would no longer be permanent commissioners. It’s not negotiable, for anyone,” he said. “Ireland is 1 per cent of the EU. You’re not going to have your own commissioner. It isn’t reasonable. There will be Irish commissioners, but by rotation.” Asked if the EU was not founded on the basis of unanimity, he responded: “Was founded on the basis of unanimity. We are evolving towards majority voting, because if we stay with unanimity, we will do nothing. Well, yes. That’s the point, isn’t it? QMV is of course the means to streamline decision making, but it does no good to suggest that unanimity and consensus are past their sell by date. One of the strengths of the EU is that it was founded on precisely those areas. And I find his blunt statement regarding his rationale for Ireland (and indeed all other members of the EU) shedding a permanent Commissioner to be dubious, not merely as regards the optics, but also the actuality.The 1% issue isn’t relevant to the Commissioner argument nor is this sentiment restricted to Ireland. But I can’t help but feel that d’Estaing is marching to his own drum on these matters. He is an avowed federalist and as that vision of the future of Europe has become less popular his pronouncements on such matters have taken on a more and more hysterical edge. Indeed, he appears to be the living definition of a man who never saw a microphone he didn’t like, which is not good for him, not good for us and definitely not good for Europe, and not merely because I believe his views are wrong (in that I’m antagonistic to federalism), his interpretation of the direction of Europe is wrong and is also divergent from the views of most in Europe (to the best that can be ascertained), but also because his one man crusade is just that, representative of him and very few others. And yet it feeds directly into a discourse where it becomes a token of what is taken to be a broader view… A little respite from his thoughts would be no harm. Posted by WorldbyStorm in British Labour Party, British Politics. It’s almost painful to read the polls taken of British public opinion one year into the Brown premiership. Because the results are a unmitigated disaster for him and for his party. Near incredibly… 74% of those questioned say that he has been a change for the worse compared with Tony Blair, and only 24% think Labour has a chance of winning the next election while he remains leader. Conservative support, at 45%, is at a 20-year high. That would give David Cameron a landslide victory as big as Labour’s win in 1997, with some 400 seats. Labour might be reduced to well under 200 MPs, with many ministers losing their seats. The Tories would retain Crewe and Nantwich, won in a byelection last month, while Labour would lose previously safe seats such as Wakefield. They now are the masters? Again. Farewell to the progressive twenty-first century. But, then how progressive has the past ten years been when a centre-right Labour government has governed with remarkable ineptitude? And let’s not place all the blame on Gordon Brown. There surely must be some element of buyer’s remorse at work here in relation to the last election. Tony Blair may not be focus for this apparent electoral rage, but he is in no small way the architect of it. …the dramatic decline in Labour fortunes since Brown took over as leader. A year ago, Labour had a four-point lead over the Tories in the June Guardian/ICM poll. Support for the party, at 39%, was 14 points higher than today. I always used to dismiss the talk relayed in the media about him being a little odd, difficult to deal with, lacking personality. But his public appearances have merely brought those tendencies to the fore. Which is odd, because I know someone who had the opportunity to observe him while Chancellor at closer quarters on a number of times across a number of years and found him both witty, warm and personable. Unfortunately the latter admirable qualities are entirely missing when translated through television, or whatever. And that’s to ignore his centre-right economic inclinations. A majority of people who backed Labour at the last election, 57%, also say that they do not think the party can win again with Brown as leader. Even among current Labour supporters, 38% think Brown cannot win. And where are those former Labour Party voters going? Liberal Democrat support, at 20%, is two points down but remains only five points behind Labour, the narrowest gap on record. Backing for other parties, at 10%, is up one on last month, partly because of the strong nationalist performance in Scotland. Labour is shedding support to both the Conservatives and the Liberal Democrats: 17% of people who backed the party in 2005 are thinking of backing the Tories instead while 7% may vote Lib Dem. Are those going to the LDs going because they can’t quite transition to the Conservatives? Or does the greater figure for the Conservatives indicate that the seemingly impenetrable psychological barrier that for so long surrounded the Conservatives has now been breached so that anyone, yes, even the Tories is a better bet than the Labour party. That said, and I’d be more rather than less certain of a Conservative victory next time out (and isn’t it remarkable how even as recently as last Autumn there was talk of shafting Cameron inside the Tory party? ), I suspect the scale of a Labour defeat might be somewhat lesser than these poll ratings imply. Still, who knows, particularly in an environment where a Blair clone is apparently the thing the British electorate wants, and now! What a pity to the Blairites that they were unable to offer up something similar to the voracious appetite of the public, but then they were always working with thin material. Remember the chatter about Alan Milburn? Grey, grey, grey. And yet, logically, could he have been worse than Brown has turned out to be? Or what of Charles Clarke who continues to lurk in the background, being somewhat less than helpful to the government last week on the 42 day detentions issue. But then one thinks of idiocies such as that and really, does it matter who is at the helm, and is it entirely unreasonable that people might quite literally give up on the Labour party? Because is a Labour Party with a higher poll rating under Blair Mk II, or even Brown, a significant improvement? Clearly not. Perhaps quite the opposite (and Phil at The Gaping Silence had some good points on the dangers of viewing politics through a prism of party advantage…). But then the question is what if the Conservatives get in, and what of the alternatives? Problem is, they don’t seem to be going left… there is no evidence at all that the further left is gaining any support at all. But that’s cold comfort in Number 10 today. And there is the worrying thought that if this is the free fall we hear so much about in politics how much further can it go? Once Blair et al dreamed of a hegemonic project that would dominate the centre left for decades. At this rate they’ll be lucky to salvage anything from the wreckage. Posted by WorldbyStorm in Society, Uncategorized. Got to agree with Zoe Williams in the Guardian today. It’s a blink and you’ll miss it story since the advert for Heinz mayonnaise was pulled by the UK Advertising Standards Authority after 200 people complained about it. Heinz’s ad features a family on a normal morning routine with a boy and girl getting ready for school and their father preparing for the office. Sandwiches are being prepared by a man with a New York accent, dressed in a deli serving outfit. The boy and girl refer to him as “mum”, and the father shares a kiss with him. Now you or I might think that the twist, such as it is, isn’t about them being two gay men, but instead that Heinz mayonnaise spread on a sandwich is equivalent to being married to a New York deli worker. And the humorous dissonance in that twist is that it’s a man. So really, it isn’t about gay men, or gay lifestyles, but about the joke of having a deli worker (who happens to be male) in your kitchen, but so what if it were? What’s astounding is that there are 200 people, or let’s be honest, probably 30 people spreading the calls around, who are exercised enough simply by a jokey television advert to ring in and complain. [the] complaints about the Heinz mayonnaise ad, which – assuming a higher final tally – should make it one of the five most offensive this year. Isn’t that great? One of the five most ‘offensive’. If this is offensive, what of Seinfeld, or the Office or Friends, all of which have depicted male/male clinches. And all of which are shown pre-watershed, at least on my television. Or is it that in some sort of voodoo-like fashion it is believed that these adverts have a more persuasive legitimating power than the programmes they intersperse? Complaints have centred on the fact that one man kissing another could be construed as homosexuality, and oblige parents to explain to children what that is. Well, yes, but considering the prevalence of the word ‘gay’ as a term amongst children perhaps only those who live the most sheltered lives would be unaware of what ‘homosexuality’ is. …never mind that mayonnaise can’t be advertised between kids’ programmes because the fat and salt content is too high. So it doesn’t matter that the product is so injurious to health that the mere mention of it is thought too toxic for pre-watershed telly; and it doesn’t matter that both the stated and tacit messages of the advert are nothing to do with sexuality of any sort, it’s a straight “mayonnaise is nice” underpinned by the British-ad fascination with men dressed as women revealed as men (think Bounty – wipe not bar). Still I think Williams makes an even better point that given the number of advertisements which are arguably offensive it is a telling reflection on our laziness – or tolerance – that we aren’t picking up the telephone a bit more often to complain. When an ad featuring men kissing is one of the most complained about, that matters: not as a reflection on the nation’s scattered homophobes breathing their last gasp, but as a sign that the rest of us don’t complain anything like enough. And if it only takes 200 or so complaints to pitch an advert into the top five, well then perhaps we should be hitting the phones a bit more often. Any contenders for most genuinely offensive? Posted by WorldbyStorm in Culture, Irish Politics, Uncategorized. Oh dear. There’s something about Fintan O’Toole. I don’t know what. When he’s on form he’s good enough. He was better and I’m not sure what happened, but sometime around the mid 1990s I began to stop reading his pieces on a regular basis. When he’s not on form he’s a sort of anti-John Waters – whose work I still find near impossible not to give the once over, I fear the day he retires – churning out stuff which strays worryingly close to arguments about ineffable and impossible to determine arguments about ‘character’. If it could be said that the Irish electorate, after due consideration of the merits of the Lisbon Treaty, had decided to vote No, then this might be cause for all Irish democrats to celebrate. But that is not what happened last week. Judging from the intelligence thus far accumulated about what I will loosely call the logic underlying the vote, the most effective slogan of the campaign appears to have been, “If you don’t know, vote No”. The outcome, then, was a disgrace, not because of the content of the decision but because of the justifications offered for it. But returning to O’Toole yesterday he provided a fascinating column in the Irish Times. For if the Lisbon Treaty exercises me as a political issue, for Fintan this is, in a curious echo of a John Waters text, a .’… hangover of evasion and duplicity in [Irish] political life…’.. And not just any hangover, as we shall see. How so, you may enquire? FORGET about the Eurobarometer surveys and the EU’s collective psychoanalysis of the Irish after the Lisbon debacle. If you really want to understand the nature of the contemporary Irish psyche and the way it has knocked the European project off course, think Carlsberg. I don’t mean to suggest that, when we voted on Lisbon, we were, as the old codger in The Fast Show used to say, “awfully drunk at the time”. I mean rather that there’s a set of Carlsberg ads tailored for the Irish market that could have been for the successful No campaign. One is set in a bar in New York. A young Irishman leaves his mates and goes to chat up an attractive blonde woman sitting at the bar. She tells him that he has to either go back to his mates or face her hulking boyfriend who is just looming into view. Instead, he embraces her and introduces himself to her boyfriend as her brother. The other ad is set in a bar in some non-English-speaking country. The Irish lads are invited, in a threatening way, to do something Irish. The options are either to run like hell or start trying to dance a humiliating jig. Instead they start speaking bits of pigeon Irish as if it were soulful poetry: “Is maith liom cáca milis. Agus Sharon Ní Bheoláin.” The tag line for both ads is “It’s not just A or B. There’s probably always a C”. It is a perfect encapsulation of the way we approached, and continue to approach, the whole Lisbon process. Option A is that we buy in, broadly speaking, to the European project and accept that the rules that can be agreed among 27 member states are inevitably compromises in which nobody gets quite what they want. Option B is that we pull back from that project into a semi-detached relationship with the EU. So we go for Option C, a vague belief that we can squirm away from the hard choices and through our marvellous charm, cunning and persuasiveness, get something completely different. “Our” marvellous charm, cunning and persuasiveness? Surely not. The view of the world that underlies those Carlsberg ads and the mentality expressed in our approach to Lisbon is a very old fantasy, embodied in the trickster. In folk tales, the trickster is a weak figure, an ordinary peasant, who gets one over on the strong – the king, the lords, the bishop – by evading and inventing, by ducking and weaving. Good Christ. This is not merely an echo of Waters, it’s his schtick imported lock stock and smoking barrel directly into the heart of an O’Toole column. Because of course we are tricksters. It reminds me of the colloquial argument that used to be trotted out time and again that the Irish electorate was the ‘most sophisticated’ in the world because of the vast intricacy of our (not at all unique) proportional representation system of voting and the unlikely conjunctions that this threw up. Ah, how we laughed in the Workers’ Party at meetings during the 1980s as we pondered yet another centre right coalition brought to us by this miracle of cosmopolitan political complexity – the Irish voter (although surely the joke was on us in DL – and Labour – in the 1990s when we managed to deliver Fine Gael to the life support machine just in the nick of time?). Of course the rather more prosaic truth was that the results of elections, and referendum tell us next to nothing about the character, or otherwise, of a people. Were we geniuses in 1995 with a divorce referendum that saw us bring it over the line by a few thousand, or merely indecisive? Neither, naturally. At that point in time more people, slightly, were persuaded that divorce would not usher in a social catastrophe than weren’t. Or what about the 1968 referendum on PR. One further demonstration of our savvy, or just a basic common sense response to an attempt to tip the playing field in a permanent Fianna Fáil direction. No. Dubious self-congratulatory cant about our peculiar genius as the economy slid ever further into decline didn’t quite cut it. Well, yes and no. Let’s put aside the near-preposterous conflation of a political event, the Lisbon Treaty referendum and this unlikely concept of ‘tricksterism’ that we’re being asked to digest. Assume for one second that tricksterism exists at all in a substantial form… if so it is almost per definition an individual response rather than a collective or societal one, so therefore it seems reasonable to argue that it couldn’t possibly sit at the root of a transformational project. But that’s a big assumption. After all, why not throw in a couple of other supposed Irish traits as well, ones which actually do seem to be reflected in societal or collective responses, such as social conservatism, stolidity, a certain passivity in the face of authority. Each or all of these could be used as a vehicle for ruminations upon the Treat referendum as well. But of course they wouldn’t suit the Carlsberg hook – which leads me in a different direction, while it is true that a certain fecklessness has entered the vocabulary of Irish advertising, one that is unpleasantly sneering and competitive (example A: the Cadbury’s Snack advert with overt bullying in it) I think that tells us more about twenty and thirty something ad execs than some underlying malaise in Irish society. Although, I’ll be the first to admit I may be wrong. We inherited this trickster mentality from our colonial past, but we’ve had a very hard job leaving it behind. Did we? Did we indeed? Or could it simply be that in a society of many millions there will be a broad range of human responses none of which can be easily pinned down rather than having to cast back towards contexts which very few of us now have any direct experience of. Which is not to deny the mythic power of the colonial period, but, let’s just say that the experience was probably a lot more mixed in terms of perceptions and indeed acquiescence on the part of a significant portion of the population than the argument O’Toole uses seems to admit. Culturally, tricksterism has been our great strength – much classic Irish literature is about evading history and weaving a way around the apparent certainties of the English language. But politically, it has been our besetting weakness. It is a mentality that takes weakness and lack of control for granted and sets about dodging a way around them. We really need a bit more evidence to substantiate this, and certainly more than this minor character trait blown up into an explanation as to why Lisbon was lost. And consider the following… like Waters it dances around the issue rather than tackling it head on. Does O’Toole suggest a clear way through the mess? Does he acknowledge that this is a political and diplomatic problem? He does not. Instead he evades the issue, which is more than ironic considering that this is precisely what he implicitly accuse others of doing by voting No. This political tricksterism, this art of ducking and diving, of endless evasion, is forgivable in the weak. It expresses a view of the world that has helped to get the oppressed through their miserable days for much of human history. But at what point does a society grow up and realise that it’s not weak anymore? Could we have reached that point now, where we’re actually willing to live with the consequences of the way we’ve voted rather than looking for someone to save us by concocting a phoney plan C? Or could it be that the column is hooey and that we can look to actual material reasons why people voted Yes and No which depend in no way upon dubious and – arguably – patronising assessments of our national character, like for example a pathetically inept Yes campaign? Sure could!